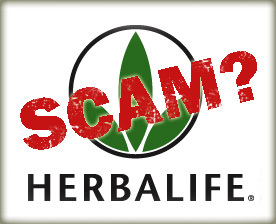 HERBALIFE SIDE EFFECTS: WHAT IS MLM ? - MULTI - LEVEL MARKETING ? PYRAMID SCHEMES ? WHAT IS MLM ? 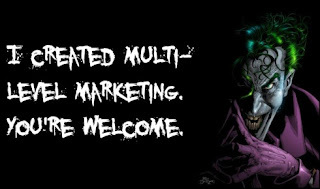 - MULTI - LEVEL MARKETING ? PYRAMID SCHEMES ? Q : WHAT IS MLM ? Most commonly, the salespeople are expected to sell products directly to consumers by means of relationship referrals and word of mouth marketing. Some people use direct selling as a synonym for MLM, although MLM is only one type of direct selling, which started centuries ago with peddling. Network marketing and Multi-level marketing have been described by author Dominique Xardel as being synonymous, and as methods of direct selling. According to Xardel, direct selling and network marketing refer to the distribution system, while the term "multi-level marketing" describes the compensation plan. Other terms that are sometimes used to describe multi-level marketing include "word-of-mouth marketing", "interactive distribution", and "relationship marketing". Critics have argued that the use of different terms and "buzzwords" is an effort to distinguish multi-level marketing from illegal Ponzi schemes, chain letters, and consumer fraud scams. Some sources classify multi-level marketing as a form of direct selling rather than being direct selling. The Direct Selling Association, a lobbying group for the multi-level marketing industry, reported that in 1990 twenty-five percent of members used MLM, growing to 77.3 percent in 1999. Companies such as Avon, Electrolux, Tupperware, and Kirby all originally used single level marketing to sell their goods and later introduced multi-level compensation plans. By 2009, 94.2% of members were using MLM, accounting for 99.6% of sellers, and 97.1% of sales. The DSA has approximately 200 members  while it is estimated there are over 1000 firms using multi-level marketing in the US alone. It is generally accepted that the first multi-level marketing plan was introduced in 1945 by the California Vitamin Company (shortly afterwards to become Nutrilite). The plan allowed Nutrilite distributors with at least 25 regular customers to recruit new distributors and draw a 3 percent commission from their sales. Unlike traditional direct selling, this was an ongoing payment whenever the customer re-ordered, allowing direct sellers to build a sales organization that could generate a residual-like income. MLM binary tree structure. The blue individual will receive compensation from the sales of the downline red members. Independent, non-salaried salespeople of multi-level marketing, referred to as distributors (or associates, independent business owners, dealers, franchise owners, independent agents, etc. ), represent the company that produces the products or provides the services they sell. They are awarded a commission based upon the volume of product sold through their own sales efforts as well as that of their downline organization. Independent distributors develop their organizations by either building an active customer base, who buy direct from the company, or by recruiting a downline of independent distributors who also build a customer base, thereby expanding the overall organization. Additionally, distributors can also earn a profit by retailing products they purchased from the company at wholesale price. The Times: "The Government investigation claims to have revealed that just 10% of Amway's agents in Britain make any profit, with less than one in ten selling a single item of the group's products." Scheibeler, a high level "Emerald" Amway member: "UK Justice Norris found in 2008 that out of an IBO [Independent Business Owners] population of 33,000, 'only about 90 made sufficient incomes to cover the costs of actively building their business.' That's a 99.7 percent loss rate for investors." Newsweek: based on Mona Vie's own 2007 income disclosure statement "fewer than 1 percent qualified for commissions and of those, only 10 percent made more than $100 a week." Business Students Focus on Ethics: "In the USA, the average annual income from MLM for 90% MLM members is no more than US $5,000, which is far from being a sufficient means of making a living (San Lian Life Weekly 1998)"
"While earning potential varies by company and sales ability, DSA says the median annual income for those in direct sales is $2,400." In an October 15, 2010 article, it was stated that documents of a MLM called Fortune reveal that 30 percent of its representatives make no money and that 54 percent of the remaining 70 percent only make $93 a month. The article also states Fortune is under investigation by the Attorneys General of Texas, Kentucky, North Dakota, and North Carolina with Missouri, South Carolina, Illinois, and Florida following up complaints against the company. "Roland Whitsell, a former business professor who spent 40 years researching and teaching the pitfalls of multilevel marketing": "You'd be hard-pressed to find anyone making over $1.50 an hour, (t)he primary product is opportunity. The strongest, most powerful motivational force today is false hope." MLM businesses operate in all 50 states. New businesses may use terms such as "affiliate marketing" or "home-based business franchising". Many pyramid schemes try to present themselves as legitimate MLM businesses. However, there are people who hold that all MLMs are essentially pyramid schemes even if legal. The United States Federal Trade Commission states "Steer clear of multilevel marketing plans that pay commissions for recruiting new distributors. They're actually illegal pyramid schemes. Why is pyramiding dangerous? Because plans that pay commissions for recruiting new distributors inevitably collapse when no new distributors can be recruited. And when a plan collapses, most people - except perhaps those at the very top of the pyramid - end up empty-handed." The FTC issued a decision, In re Amway Corp., in 1979 in which it indicated that multi-level marketing was not illegal per se in the United States. However, Amway was found guilty of price fixing (by effectively requiring "independent" distributors to sell at the same fixed price) and making exaggerated income claims. The revised proposal, however, would not reach multi-level marketing companies or certain companies that may have been swept inadvertently into scope of the April 2006 proposal. Walter J. Carl stated in a 2004 Western Journal of Communication article that "MLM organizations have been described by some as cults (Butterfield, 1985), pyramid schemes (Fitzpatrick & Reynolds, 1997), or organizations rife with misleading, deceptive, and unethical behavior (Carter, 1999), such as the questionable use of evangelical discourse to promote the business (Hopfl & Maddrell, 1996), and the exploitation of personal relationships for financial gain (Fitzpatrick & Reynolds, 1997)". In China, volunteers working to rescue people from the schemes have been physically attacked. MLM's are also criticized for being unable to fulfill their promises for the majority of participants due to basic conflicts with Western cultural norms. There are even claims that the success rate for breaking even or even making money are far worse than other types of businesses: "The vast majority of MLM’s are recruiting MLM’s, in which participants must recruit aggressively to profit. Based on available data from the companies themselves, the loss rate for recruiting MLM’s is approximately 99.9%; i.e., 99.9% of participants lose money after subtracting all expenses, including purchases from the company." In part, this is because encouraging recruits to further "recruit people to compete with [them]" leads to "market saturation." Another criticism is that MLM has effectively outlived its usefulness as a legitimate business practice. The argument is that, in the time when America was a series of relatively small, isolated towns and rural areas not easily accessible to small companies, MLM was a useful way to let people know of and buy products or services. But the advent of internet commerce, with its ability to advertise and sell directly to consumers, has rendered that model obsolete. Thus, today, nearly all modern MLMs ostensibly sell vastly overpriced goods and services (if there even is a real product or service involved at all) as a thin cloak of legitimacy, while their members are driven to recruit even more people into the MLM, effectively turning these programs into pyramid schemes. 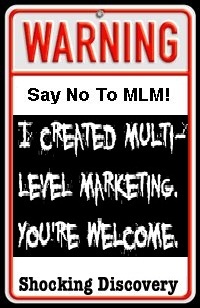 Because of the encouraging of recruits to further recruit their competitors, some people have even gone so far as to say at best modern MLMs are nothing more than legalized pyramid schemes with one stating "Multi-level marketing companies have become an accepted and legally sanctioned form of pyramid scheme in the United States" while another states "Multi-Level Marketing, a form of Pyramid Scheme, is not necessarily fraudulent." In October 2010 it was reported that multilevel marketing companies were being investigated by a number of state attorneys general amid allegations that salespeople were primarily paid for recruiting and that more recent recruits cannot earn anything near what early entrants do. Amway grew quickly in China from its market launch in 1995. In 1998, after abuses of illegal pyramid schemes led to riots, the Chinese government enacted a ban on all direct selling companies, including Amway. After negotiations, some companies like Amway, Avon, and Mary Kay continued to operate through a network of retail stores promoted by an independent sales force. China introduced new direct selling laws in December 2005, and in December 2006 Amway was one of the first companies to receive a license to resume direct sales. However, the law forbids teachers, doctors, and civil servants from becoming direct sales agents for the company and, unlike in the U.S., salespeople in China are ineligible to receive commissions from sales made by the distributors they recruit. In 2006, Amway China had a reported 180,000 sales representatives, 140 stores, and $2 billion in annual sales. In 2007 Amway Greater China and South-east Asia Chief Executive Eva Cheng was ranked No.88 by Forbes magazine in its list of the World's Most Powerful Women. In 2008, China was Amway's largest market, reporting 28% growth and sales of ¥17 billion (US$2.5billion). According to a report in Bloomberg Businessweek in April 2010, Amway had 237 retail shops in China, 160,000 direct sales agents, and US$3 billion in revenue. Two overt examples of pyramid schemes are a chain letter and a Ponzi scheme, while a stock market bubble, particularly fueled by lines of credit (margin accounts) is a more subtle example. A successful pyramid scheme combines a fake yet seemingly credible business with a simple-to-understand yet sophisticated-sounding money-making formula which is used for profit. The essential idea is that a "con artist" Mr. X, makes only one payment. To start earning, Mr. X has to recruit others like him who will also make one payment each. Mr. X gets paid out of receipts from those new recruits. They then go on to recruit others. As each new recruit makes a payment, Mr. X gets a cut. He is thus promised exponential benefits as the "business" expands. Such "businesses" seldom involve sales of real products or services to which a monetary value might be easily attached. However, sometimes the "payment" itself may be a non-cash valuable. To enhance credibility, most such scams are well equipped with fake referrals, testimonials, and information. travels up the chain. Only the originator (sometimes called the "pharaoh") and a very few at the top levels of the pyramid make significant amounts of money. The amounts dwindle steeply down the pyramid slopes. Individuals at the bottom of the pyramid (those who subscribed to the plan, but were not able to recruit any followers themselves) end up with a deficit. Many pyramids are more sophisticated than the simple model. These recognize that recruiting a large number of others into a scheme can be difficult so a seemingly simpler model is used. In this model each person must recruit two others, but the ease of achieving this is offset because the depth required to recoup any money also increases. The scheme requires a person to recruit two others, who must each recruit two others, who must each recruit two others. The "eight-ball" model contains a total of fifteen members. Note that unlike in the picture, the triangular setup in the cue game of eight-ball corresponds to an arithmetic progression 1 + 2 + 3 + 4 + 5 = 15. The pyramid scheme in the picture in contrast is a geometric progression 1 + 2 + 4 + 8 = 15. Prior instances of this scheme have been called the "Airplane Game" and the four tiers labelled as "captain," "co-pilot," "crew," and "passenger" to denote a person's level. Another instance was called the "Original Dinner Party" which labeled the tiers as "dessert," "main course," "side salad," and "appetizer." A person on the "dessert" course is the one at the top of the tree. Another variant, "Treasure Traders," variously used gemology terms such as "polishers," "stone cutters," etc. or gems like "rubies," "sapphires," "diamonds," etc. Such schemes may try to downplay their pyramid nature by referring to themselves as "gifting circles" with money being "gifted." Popular schemes such as the "Women Empowering Women" do exactly this. Whichever euphemism is used, there are 15 total people in four tiers (1 + 2 + 4 + 8) in the scheme - with the Airplane Game as the example, the person at the top of this tree is the "captain," the two below are "co-pilots," the four below are "crew," and the bottom eight joiners are the "passengers." The eight passengers must each pay (or "gift") a sum (e.g. $1000) to join the scheme. This sum (e.g. $8000) goes to the captain who leaves, with everyone remaining moving up one tier. There are now two new captains so the group splits in two with each group requiring eight new passengers. A person who joins the scheme as a passenger will not see a return until they advance through the crew and co-pilot tiers and exit the scheme as a captain. 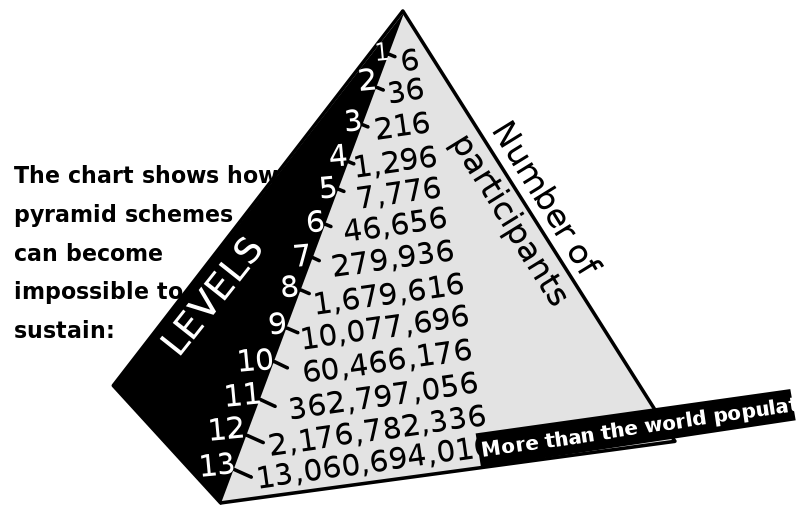 Therefore, the participants in the bottom 3 tiers of the pyramid lose their money if the scheme collapses. If a person is using this model as a scam, the confidence trickster would make the lion's share of the money. They would do this by filling in the first 3 tiers (with 1, 2, and 4 people) with phony names, ensuring they get the first 7 payouts, at 8 times the buy-in sum, without paying a single penny themselves. So if the buy-in were $1000, they would receive $8,000, paid for by the first 8 investors. They would continue to buy in underneath the real investors, and promote and prolong the scheme for as long as possible to allow them to skim even more from it before it collapses. Although the 'Captain' is the person at the top of the tree, having received the payment from the 8 paying passengers, once he or she leaves the scheme is able to re-enter the pyramid as a 'Passenger' and hopefully recruit enough to reach captain again, thereby earning a second payout. Matrix schemes use the same fraudulent non-sustainable system as a pyramid; here, the participants pay to join a waiting list for a desirable product which only a fraction of them can ever receive. Since matrix schemes follow the same laws of geometric progression as pyramids, they are subsequently as doomed to collapse. Such schemes operate as a queue, where the person at head of the queue receives an item such as a television, games console, digital camcorder, etc. when a certain number of new people join the end of the queue. For example ten joiners may be required for the person at the front to receive their item and leave the queue. Each joiner is required to buy an expensive but potentially worthless item, such as an e-book, for their position in the queue. The scheme organizer profits because the income from joiners far exceeds the cost of sending out the item to the person at the front. Organizers can further profit by starting a scheme with a queue with shill names that must be cleared out before genuine people get to the front. The scheme collapses when no more people are willing to join the queue. Schemes may not reveal, or may attempt to exaggerate, a prospective joiner's queue position which essentially means the scheme is a lottery. Some countries have ruled that matrix schemes are illegal on that basis. The network marketing or multi-level marketing (abbreviated MLM) business has become associated with pyramid schemes as "Some schemes may purport to sell a product, but they often simply use the product to hide their pyramid structure." and the fact while some people call MLMs in general "pyramid selling" others use the term to denote an illegal pyramid scheme masquerading as an MLM. Some believe MLMs in general are nothing more than legalized pyramid schemes. pyramid schemes :—also referred to as franchise fraud or chain referral schemes—are marketing and investment frauds in which an individual is offered a distributorship or franchise to market a particular product. The real profit is earned, not by the sale of the product, but by the sale of new distributorships. Emphasis on selling franchises rather than the product eventually leads to a point where the supply of potential investors is exhausted and the pyramid collapses. WinCapita was a scheme run by Finnish criminals that involved about €100 million. The 1997 rebellion in Albania was partially motivated by the collapse of pyramid schemes. Throughout 2010 and 2011 a number of authorities around the world including the Australian Competition and Consumer Commission, the Bank of Namibia and the Central Bank of Lesotho have declared TVI Express to be a pyramid scheme. TVI Express, operated by Tarun Trikha from India has apparently recruited hundreds of thousands of "investors", very few of whom, it is reported, have recouped any of their investment. This is a list of Wikipedia pages about companies which use multi-level marketing (also known as network marketing, direct selling, referral marketing, and pyramid selling) for most of their sales. New Delhi: As many as 87 companies have come under the scanner for alleged irregularities related to chit fund schemes and money circulation in the garb of multi-level marketing, the government said, reports PTI. The Registrar of Companies (RoC) and its Regional Directors have been asked to scrutinise the balance sheets and inspect the books of accounts and other records of these 87 companies, Minister of State for Corporate Affairs RPN Singh informed the Rajya Sabha. In reply to a query whether the Ministry has asked RoC to probe the accounts of chit fund companies and certain multi- level marketing (MLM) firms, the minister replied in affirmative. Singh said the directions have been issued on the basis of specific complaints received by the Ministry against these companies, which are "alleged to be carrying on the activities related to prize chit fund and money circulation in the garb of multi-level marketing". The minister was asked whether complaints have been received from investors about being cheated through MLM money circulation schemes. Singh further said that Serious Fraud Investigation Office (SFIO) has recommended setting up of a specific central regulatory agency for the implementation of the Prize Chit and Money Circulation Scheme (Banning) Act, 1978. The Act is administered by the Department of Financial Services (DFS), which has constituted an Inter-Ministerial Group consisting of representatives from DFS, Ministry of Corporate Affairs (MCA), the Reserve Bank, Securities and Exchange Board of India (SEBI), Department of Consumer Affairs and Central Economic Intelligence Bureau. The Group will draft model rules on MLM companies and on the prohibited schemes under this Act, and also frame clarificatory guidelines on how to distinguish between direct sales from disguised money circulation schemes. To another question on whether the investigations were being referred to SFIO, rather than being conducted by RoCs, Singh said that multi-dimensional financial irregularities and frauds of complex nature are normally assigned to SFIO. He said that SFIO is a "multi-disciplinary investigative agency comprising of experts from banking sector, capital market, company law, general law, forensic, audit, taxation, information technology etc." The minister further said that various sections of the Companies Act empowers the central government to appoint inspectors for investigation of affairs of a company, but no extra-judicial power is bestowed upon the SFIO. He said that RoC has powers to call for necessary information or explanation from any company, based on the documents submitted to its office by the company, and submit a report to the central government. On the basis of RoC report, the government can order investigations into the affairs of the company. In reply to another question on whether applications under Right to Information (RTI) Act are piling up in the various offices of the Corporate Affairs Ministry, Singh said that all RTI applications are attended to on a priority basis. Many illegal pyramid schemes are often disguised as legitimate MLM companies. I am providing a little chart that will help consumers protect themselves from pyramid schemes. Consumers approached to participate in a Multi Level Marketing plan (or sometimes the call it Direct Selling plan) should be able to consult the list below to help them determine whether this plan is legitimate or not. In the following chart you can see things that describe your “business opportunity”. See how many similarities you have with a Multilevel Marketing Company Plan and how much similarities there are with Pyramid Scheme business and judge if it’s better to join or not. Recruiting more members to join a promissing business or recruit people in order for them to be recruiters also. Company’s Profits The company’s profits come mainly from the sales of products and services by the distributor. Perhaps some percentage of income from sales by downline/mlm recruits but this should be much less than 50%. Most of the profits of this company come from new recruits and bonuses that come from this constant flow of new people that join the company. Products / Services Household services or products that are used in everybody’s daily life. Goods or services are in competitive price with traditional retail outlets. Often poorly-made and “miracle” product or service that few consumers really need. Products or services are overpriced comparing them to relevant products in retail stores. Start-up Costs Low fees to be a reseller or no costas at all. Serious amount of money needed to get the reseller involved, often needed is recurring “membership” fees or expensive training or advertising material, also overcharged. Support from the Sales System Low-pressure and willing to answer questions regarding the products / services or the marrketing plan. Very High pressure from uplines to achieve end of month bonus, with a constant focus on recruiting new members or distributors. When real questions come up, no real support regarrding products/services. References Willing to provide references of real people’s examples who have succeeded in this Marketing Plan. Unable to provide references from real people that have succeeded. On the other hand they might provide examples of people getting rich using the marketing plan, that live in other countries. Information on business or company Available? Must have a report with the Better Business Bureau (BBB) and is also registered with the Chamber of Commerce of your country. Must provide a company address and should be a real company. Marketing materials should be of no or minimal charge. Information on the official website is very limited and information about the company is not enough fore someone to make conclusions. Text on the website is very generic and does not provide enough information about the quality of the actual product/service. Contact details are not full. Buying back the products? The company is so sure about the success of the product that buys back the unsold products at 80% or more of purchase price. Company refuses to buy back unsold products or buys back at 10-20% of the price. Can i get out of this business? Easily accomplished and also merchandise can be bought back. Difficult or impossible due to high-pressure tactics used to keep you related with the company. Of course investment is usually lost or more money needed to get investment back. How Long the Business Will Last It depends on the repeat of sales of the product / service and how the company manages to keep the product/service competitive to other similar products/services. It is said that every Pyramid Scheme business is sure that it will collapse. When distributors stop joining then the doomday for the company is very close. How Likely You’ll Profit The profit comes from selling services and products to end users. It depends on how well someone can do that. Make good sales and have great profits. Most of the members or distributors loose money. Only the people that actually run the company gain loads of money. Bottom Line It seems like a Legal Company Scheme. Just ask yourseld how well you can do with it. It’s illegal. Don’t waste your time and money. Social Media Training delivered by expert practitioners. We will teach you everything you need to know from the basics to advanced social media strategy. Get daily ideas and instructions for generating $1,000s per day FROM HOME totally FREE. So I took a video of myself actually getting paid over $500 for filling paid surveys. With voice, text & data plans always start at £0.00/month (100% FREE CALLS). Content and web 2.0 creation goes hand in hand. And when we speak in context of Internet, it is the most important aspect.